Brief summary of the paper: Epidermal growth factor receptor (EGFR) is a known target in cancer therapy and targeting the receptor has proven to be extremely successful in treating cancers that are dependent on EGFR signaling. To that effect, targeted therapies to EGFR such as Cetuximab, Panitumumab-monoclonal antibodies and Gefitinib, Erlotinib-tyrosine kinase inhibitors have had success in therapeutic scenarios. However, the development of resistance to these drugs makes it necessary to combine anti- EGFR therapies with other inhibitors, so that resistance can be overcome by the targeting of alternate signaling pathways. On the other hand, components of the inflammatory pathway, within and around a tumor, provide a conducive environment for tumor growth by supplying numerous cytokines and chemokines that foster carcinogenesis. Interleukin 6 (IL-6) is one such cytokine that is found to be associated with inflammation-driven cancers and which also plays a crucial role in acquired resistance to anti-EGFR drugs. The EGFR and IL-6 signaling pathways crosstalk in multiple ways, through various mediators and downstream signaling pathways driving resistance and hence co-targeting them has potential for future cancer treatments. 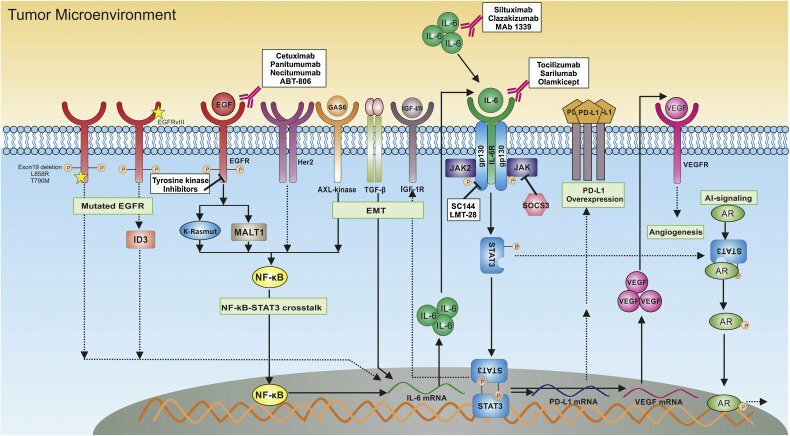 Here we provide an overview on the crosstalk between the EGFR and IL-6 pathways, and discuss how co-targeting these two pathways could be a promising combination therapy of the future.